In today's online multiplayer shooter edition of Speak Up on Kotaku, commenter WhoKnew? 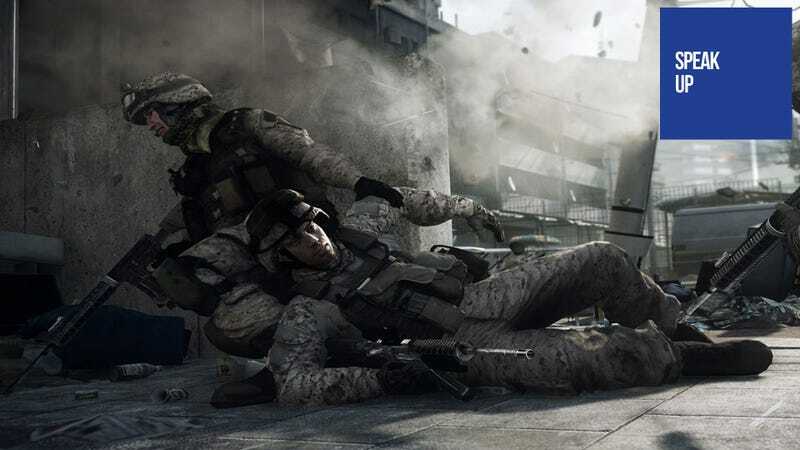 lists the tweaks he believes will lead to more people playing Battlefield 3 than Modern Warfare 3 this fall. While the internet is filled with Battlefield 3 vs. Modern Warfare 3 propaganda that pretty much defines fanyboyism at its best, there is really only one issue that needs to be addressed by you guys. No, it's not frame rates, or engines, or multiplayer details. Let's talk lobbies. We need to get this right. The one big, over looked advantage that the Call of Duty franchise has is the seamless lobby system. There needs to be a better lobby system in Battlefield 3 then there was in Battlefield: Bad Company 2. Everyone needs to be able to talk to everyone between matches. This is just a must. Trash talking is part of the appeal of playing a multiplayer game (when keeping it classy). To not be able to taunt or trash talk your opponents between rounds, is rather boring. Everyone on your team needs to be able to communicate during matches. Not just whoever is in your four-man squad. Let's face it, I have a ton of friends I want to be able to talk to during my matches, not just three. This is almost a deal breaker to anyone who loves online play with a bunch of friends. It is also why the majority still flock to the Call of Duty series. There needs to be a kill/death screen at the end of a round. I know the franchise is not big into focusing on kill/death ratios but there needs to be one. It doesn't have to be the main screen but please let us scroll to a screen where we can see this data. In a world where, let's face it, everyone (well, majority) is obsessed with kill/death, it needs to be there. Please listen and I guarantee your player numbers will not only meet but exceed that of your rival franchise.